Mexican wrestlers and stats! This is going to be fun. 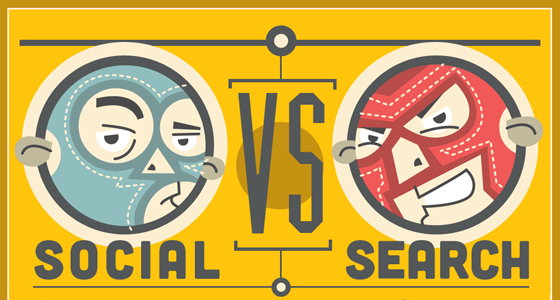 So get your mask and stretchy pants on and prepare for a fight between social media and search marketing. Alright, here we go. Social comes out swinging with a few B2C lead gen elbows to the chest, pushing Search back against the ropes. The Social followers in the crowd are chanting 34% is better than 24% Search sucker! Search spins out and clothes-line’s Social onto his back, then stamps his B2B SEO authority on Social’s chest. Trying to finish, Search bends Social into an arm lock, eliciting a Mexican scream that translates roughly to “#$!*#$%”. Could this be a first round win? BNo, Social wriggles free and gets to his feet, saved by the bell. Social head-butts Search while the ref isn’t watching, then reminds Search that social media can have a real conversation with people, building brand awareness and fans at a much faster pace. Plus, they don’t get dinged by Google’s silly animal names like Panda. As Search stomps around embarrassed by the verbal beating, Social takes advantage to pick Search up and slam him head first into the canvas with an epic pile-driver! Search trumps Social for finding local businesses by a whopping ratio of 38 to 3 and unleashes a series of elbows to the crouched back of Social, picks him up, swinging him in a circle before throwing him out of the ring. The Social corner, towel in hand, is ready to end it all, when Social crawls his back through the ropes and sneaks in a dirty below-the-belt knee to Searchs’ groin, which get’s him through to the end of the round. 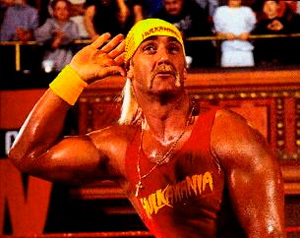 As he staggers back to his corner, Search manages to wind his arm in a circle up to his ear to rouse the crowd. Hulk Hogan would be proud. This is an easy one for Social. Search has no skills when it comes to interacting with searchers, he doesn’t even know who his visitors are (he beat up Analytics in an earlier bout, and they’re not on speaking terms). Social is a new man (64% to 35% of fans in the crowd are in favor of Social), he climbs to stand on the corner of the ring as the crowd goes wild. A few bounces on the ropes later, Social spins through the air to smash Search with a body slam, pinning him to end the fight. But just as the count nears 3 to give Social the victory, another wrestler jumps the ropes and smashes the back of Social with a chair! What is this? The WWE? The ref pushes him out of the ring, just as the bell sounds for the end of the fight. The judges tally their scores and the ref announces a tie, bringing boos and beer cups into the ring. Nobody likes a draw. But what is this? Search and Social are hugging and figure they’d be better off starting a tag team as Search mentions that the engines are starting to include social scoring into their algorithm. In fact 50% of the crowd now admits that they use both methods together and that Social has had an impact on their Search results. Start using social and search together. It’s a winning combination.